We’d love your help. Let us know what’s wrong with this preview of It's a Wild Life by Bud DeYoung. Since childhood, Bud had a passion for animals. As an adult, that passion led to the rescue of a bear who lived in his family’s house, then more animals crowding for space, until Bud eventually built an entire private zoo around his home in Michigan’s Upper Peninsula. Pursuing your passion includes a whole lot of crap. For Bud DeYoung, that’s about two hundred pounds a day! To ask other readers questions about It's a Wild Life, please sign up. I've had the honor and the pleasure to meet speak with Bud DeYoung - what he does is nothing short of amazing. Bud DeYoung’s love of animals started early. As a child, his collection grew from a flock of ducklings in the back yard to chickens, pigeons and all sorts of critters in trouble. Instead of delving into sports, Bud chose to give guided tours through his backyard menagerie @ two bits a trip. Eventually, his passion grew into a full-fledged animal rescue operation. A zoo. We come to know the personalities of various animals, presented like well-loved members of the family. Wallace, the hippo that r Bud DeYoung’s love of animals started early. As a child, his collection grew from a flock of ducklings in the back yard to chickens, pigeons and all sorts of critters in trouble. Instead of delving into sports, Bud chose to give guided tours through his backyard menagerie @ two bits a trip. Eventually, his passion grew into a full-fledged animal rescue operation. A zoo. We come to know the personalities of various animals, presented like well-loved members of the family. Wallace, the hippo that responds to verbal commands and crushes watermelons between his jaws to impress the crowd. Teddy Bear, the four-hundred pound black bear rescued from a small enclosure to discover the wonders of grass beneath his feet and roaming free. Or Louie the loving orphan-chimp whose best friend was a dingo named Janis. Scenes throughout impart the frantic feel of zoo-life to the reader, keeping one turning the pages to see what-in-the-world will happen next. Bud and his friend, Carrie, give us an inside look at the daily delights and challenges of running a zoo. We learn how adopting one chimp led to a desire to create a primate rescue facility to save many and how a close encounter with a pet deer’s antlers turned dangerous in a heartbeat. Pick up this book for a bit of adventure. It is a novel escape into the wild - right in your living room. This was a fascinating look into what it takes to make a zoo. It comes across loud and clear that Bud DeYoung and Carrie respect and love all creatures. In It's a Wild Life, we see the hardship, the non-stop work and the dedication Buddy DeYoung put into building his zoo. In stories both heartwarming and heartbreaking, we get to know some of the zoo and rescue animals. Especially nice to read was about Teddy Bear's last, best year. Surprisingly, Buddy doesn't have a favorite animal. He likes the This was a fascinating look into what it takes to make a zoo. It comes across loud and clear that Bud DeYoung and Carrie respect and love all creatures. In It's a Wild Life, we see the hardship, the non-stop work and the dedication Buddy DeYoung put into building his zoo. In stories both heartwarming and heartbreaking, we get to know some of the zoo and rescue animals. Especially nice to read was about Teddy Bear's last, best year. Surprisingly, Buddy doesn't have a favorite animal. He likes the chickens and pigeons as much as the hippo, lions and tigers and bears. I've only visited the zoo three times, briefly. The first time, years ago, there were pens full of animals. By my second visit, everything was double fenced and on my most recent visit, I saw even more progress, with trails and habitats. This book gives us the behind the scenes thoughts and reasons for many of the questions I had and I'm sure other people have about the zoo. I found this to be an honest and moving account of one man's passion for animals - for over 40 years, Bud DeYoung has been looking after animals. The book charts the animals Bud has owned over the years; the joy he has found in taking care of them and sharing them with others and; some of the injuries he's sustained looking after them! Bud is clearly a very hard worker and has been for most of his life - he's also had lots of help over the years and there was a clear desire to thank some of those I found this to be an honest and moving account of one man's passion for animals - for over 40 years, Bud DeYoung has been looking after animals. The book charts the animals Bud has owned over the years; the joy he has found in taking care of them and sharing them with others and; some of the injuries he's sustained looking after them! Bud is clearly a very hard worker and has been for most of his life - he's also had lots of help over the years and there was a clear desire to thank some of those people in this book. The book is heartfelt without becoming over sentimental, many of the stories will be saddening and/or heart-warming to animal lovers - for me, this started with Teddy Bear who Bud rescued from a very small enclosure and carried on with tales of Louie the chimpanzee, Wallace the hippo and more animals than you can believe. The book ends with a selection of letters from visitors to the DeYoung Family Zoo, which give a glimpse into how inspirational the zoo has been to many people. Interesting story, jumped around a lot, but the story overcame that. Bud DeYoung always wanted a life with animals. Starting from a young age he brought home critters and cared for them. Even though he was sidetracked by circumstances into working the family store, he still kept up with his critters. Starting with poultry, fowl and small animals. His mother encouraged him to follow his dreams. And he has been doing so ever since he was young. Through a failed marriage, financial issues and fierce Michigan winters, he preserved and kept his dream alive. His private zoo thrives in Michigan’s Upper Peninsula regardless of the hardships. Bud’s first big animal was a bear he rescued that ended up living in his home. In this book, Bud takes us from his childhood, through his first encounters with wildlife, a failed marriage to his first love and on to his finding a perfect partner in a visitor to the zoo. The DeYoung Family Zoo was even featured on Nat Geo Wild for a season. Bud tells us how he ended up in this strange profession, following his dream every day, and dreaming bigger and better always. Through Bud’s own words we meet his partner in the zoo and in life Carrie. She was a regular visitor that came and ended up staying. Even after meeting his wolves(a way he weeded out the dates previously). Carrie not only thrived as his partner, bringing passion and new ideas to the zoo, but also started her own rescue. The stories dealing with her rescue are so heartwarming and full of hope and love. For me I have to say that the parts of this book I enjoyed most were THE LETTERS FROM OUR VISITORS, HOW IT ALL COMES BACK AND BEYOND OUR DREAMS. Those were so inspiring and heartfelt. This is a very enjoyable book. The format is nice and keeps you entertained with humor, kindness and depth of knowledge. It is not a preaching in your face book. More like sitting on a rambling porch listening to wonderful stories told by a kind hearted man. Any animal lover, like myself, will find this a beautiful story full of inspiration and love. I first "met" Bud and Carrie thru Nat Geo's "Wild" last year and loved every minute. When I picked up "It's a Wild Life" to read and review, I knew it would be fantastic - and I wasn't disappointed!!! Well written, and told from Bud's perspective, "It's a Wild Life" is a great read, funny in places, sad in others and a fantastic learning experience all on its own! Bud DeYoung's love of animals of all kinds has led him on a journey through life which ultimately developed into the DeYoung family zoo in the Upper Peninsula and Carrie's Rescue Ranch. From rescued animals to wild adoptees, life is always an adventure for Bud and Carrie!! Baby animals spend their first months in the family house and often get into all kinds of mischief. The parrot taunting the young cougar with adult cougar growls had me rolling with laughter!! The animal adventures Bud tells are quite enjoyable and will undoubtedly endear the various creatures in many readers hearts. I couldn't put DeYoung's book down and was even a bit sad when I turned the last page. 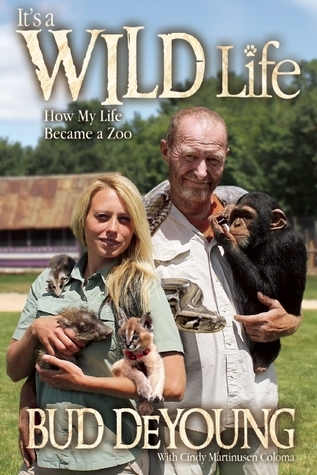 I will definitely be telling all my friends to read "It's a Wild Life - How My Life Became a Zoo." This review has been hidden because it contains spoilers. To view it, click here. Had I picked this book up a couple of years ago when I knew less about animal rescue/ what are legally defined sanctuaries, the Lacey Act that prevents the trade of animals that have been illegally taken from the wild, possessed, transported and sold (which DeYoung has been found to have violated) and other depressing facts about animal trafficking I would probably have enjoyed it. Unfortunately because I do have a better understanding of wildlife rescue I just could not like this book. From wha Had I picked this book up a couple of years ago when I knew less about animal rescue/ what are legally defined sanctuaries, the Lacey Act that prevents the trade of animals that have been illegally taken from the wild, possessed, transported and sold (which DeYoung has been found to have violated) and other depressing facts about animal trafficking I would probably have enjoyed it. Unfortunately because I do have a better understanding of wildlife rescue I just could not like this book. From what I can tell, DeYoung is in no way "helping" these animals. Just because you like animals does not always mean that you know the best way to help protect, provide healthy food, provide enrichment etc. Had he decided to stick with domestic animals I probably would have been ok with the book. But as he made the decision to purchase animals he stopped being a guy who likes animals and will take in homeless animals or animals in need of rescue to just another guy more interested in exploiting animals than saving them. Won through LibraryThing's early reviewers. This is a great book that tells the story of two people who have dedicated their lives to animals. It tells the reality of the ups and downs of the lifestyle they have chosen and why they have decided to take on this immense task. Truly heartwarming and inspiring, this is an excellent book. Its a beautiful book, as beautiful as its cover. Gives a lot of information about animals. Some of the incidents are heart-touching. Any animal lover will like this book. However, i found first half of book little weakes as compared with second half. *i received this book from librarything early reviewer program. A quick read about a truly amazing and giving couple, who are in love with animals, and have their own zoo and rescue ranch. They have devoted themselves to sharing their love of animals with their visitors, and sound extraordinarily kind and giving to their guests, especially children, and the ill and the elderly. I would love to visit their zoo, and meet them. I received a copy of this book from the LibraryThing early reviewer program in exchange for an unbiased review. It is one man's life story of his love for animals, how he always wanted his own zoo, and how he made that dream a reality in his life. I enjoyed the story overall. It was a bit disjointed in places, but interesting nonetheless. This book is not a well-written masterpiece - but it is an easy, enjoyable read. It was nice to get the background story and some insight on the people that run the amazing zoo that is so close to where I'm from. Definitely a book for people that have visited the DeYoung Family Zoo or for people that just love animals of all kinds. What happens when an ordinary man doesn't give up his childhood dreams and builds his own zoo not far from Green Bay? A story about men and animals, sometimes funny sometimes sad but always deeply human. Maybe not the best edited, randomly jumping in time. An interesting read about how one man has dedicated his life to rescuing animals and rung a zoo in the Upper Peninsula of Michigan. picked up this book after visiting zoo in Wallace, Michigan. Light and educational reading. Anxious to visit zoo again soon.